In 1820, almost everyone in the world lived in extreme poverty. Since this time, incomes in the developed world have increased more than 12 fold, eradicating extreme poverty in these countries. In the UK, income per person was equivalent to Africa today in 1820 and to Latin America today in 1950. 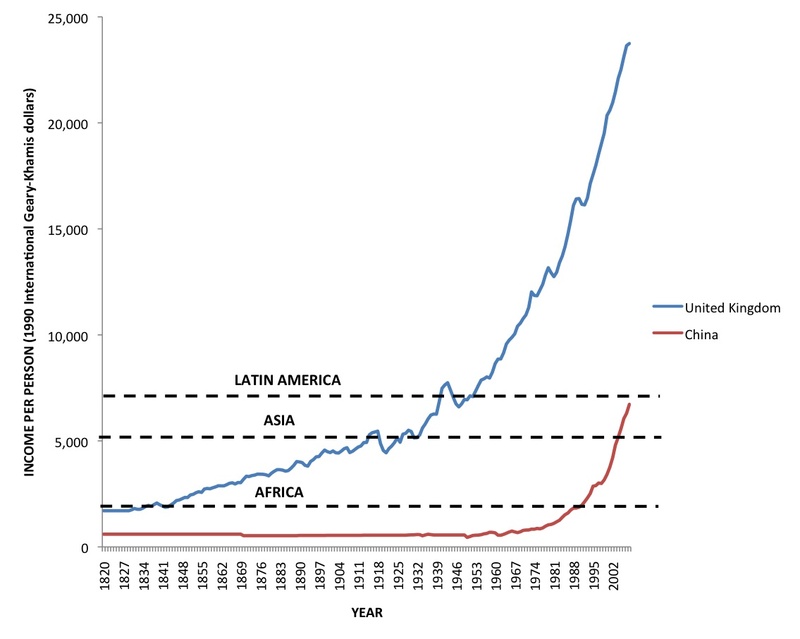 While in China income per person was equivalent to Africa today twenty-five years ago and is now similar to Latin America. Income per person only tells part of the story of how living standards have changed over time. For example, due to improvements in medicine, child mortality in Africa is around one quarter of the rate of the UK in the early 1800s, even though they had similar income per person. The eradication of extreme poverty in less than two centuries in some countries provides hope that extreme poverty can be eliminated from all countries. For most of human history, extreme poverty was the norm. This only began to change in the last couple of centuries as some countries (largely in Western Europe and North America) experienced prolonged periods of economic growth. The chart below shows the steady increase in income per person over the last two hundred years in the UK. In 1820, income per person was equivalent to Africa today, while by 1950 incomes were similar to Latin America today. Rapid economic growth in China led to the same increase in income per person, which took the UK 130 years, in just 25 years. This has led to hundreds of millions of people escaping from extreme poverty. To get a more holistic understanding of how living standards have changed over time, it is important to go beyond the income per person measure. Advances in medicine have allowed for higher levels of development for a given income level than what today’s developed countries experienced in the 1800s. For example, in the UK in the early 1800s, every second child died before the age of five. While around one in seven children die before five in Africa today. Next month, World Leaders will discuss the next Millennium Development Goals and whether to include a timeframe to end extreme poverty by 2030. This is a truly historic moment in human history as it was really only a couple of centuries ago that extreme poverty began to be permanently reduced.